Ph.D. in English Literature is a 3-5 year Doctorate Level Course, specializing in English Literature. Candidates who have completed a Master’s Degree in English, or in any other Humanities Background with English Medium are eligible for the course. Candidates have to be involved majorly in research work and can pursue this course full time or part time. Admission to Ph.D. in English Literature course is mainly standardized. A general admission procedure includes a written entrance test followed by an interview. Almost all universities offering this course conduct their own entrance tests and interviews. Ph.D. in English Literature is a perfect choice for those who have a keen interest towards literature and want to pursue further research in this area. Students who complete this course gain in-depth knowledge about the history, evolution, and significance of English literature. The average tuition fee charged for Ph.D. in English Literature course ranges from INR 12000 to 125000. The most preferred career choice after pursuing this course is academics and many Doctorates opt for the role of Professor in colleges and universities. Many other job profiles like Editor, Writer, Translator, Critical Journalist and Philosophical Journalist are also available after completing this course. 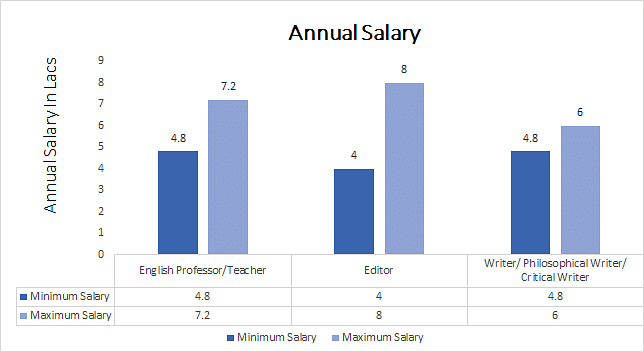 Since Ph.D. in English Literature is a prime level course, the average salaries offered are very high. One can expect an average salary of INR 5 to 8 LPA right after completing this course. Job Positions Professor/Teacher, Editor, Writer etc. Ph.D. in English Literature: What it is about? Being a Doctorate Course, Ph.D. in English Literature involves very high intellect value and deep interest in the subject. This course is specifically designed for those students who are particularly interested towards literature and want to take their knowledge of literature to exponential levels. A full-time Ph.D. in English Literature involves attending 5 to 6 days of classes per week. The students who opt for a part time program, generally have to attend classes only on weekend. The students are made to go through all the major aspects of English Literature like American Literature, British Literature, Commonwealth Literature and Indian Writing in the language. Further, the students have to later work under a professor and have to write their own thesis on the learning they accomplished during the course. Ph.D. in English Literature course trains students to have a complete understanding of various aspects of English literature. The detailed thesis enables the students to have their own opinion and viewpoint about the literature they studied. Students completing this course are best suited to share their knowledge of English Literature to the upcoming aspirants and to the world. Candidate must have completed a Master’s Degree (M.A.) from a recognized university. The specialization preferred here is English, however, students from other backgrounds with English as a medium of instruction can also take admission in this course. The candidate must have scored at least 55% marks in M.A. course pursued by him/her. Some relaxations are available to SC, ST and Physically handicapped students in this regard. Additional qualifications like M.Phil. or being UGC NET/JRF qualified are considered beneficial while admission and such students do get some advantages over students who do not have such qualifications. Firstly, it is wiser to go through the website or prospectus of the institute or university that a candidate wants to get admission in. This is done to make sure whether the candidate fulfills the eligibility criteria or not. The next step is to apply for the entrance test of the institute. The forms are generally available online. The test usually comprises of two sections – One on research methodology and another one on subject knowledge. If the candidate clears the cutoffs for the written test, he/she will need to attend the interview. The interview schedule is generally communicated on the website of the college. If the candidate passes the interview, he/she is offered the admission. Students will need to submit a preliminary fee to secure their seat. Candidates who are M.Phil. qualified or UGC NET/JRF qualified may not need to sit for the entrance test. Some institutes directly call such students for interviews, without taking any written test. As mentioned earlier, Ph.D. in English Literature is a blend of mainly two aspects, attending classes on subjects and writing a thesis on extensive research done by the candidates. Ph.D. students also have to go through rigorous examinations to pass the course. The course is mostly theoretical and revolves around Medieval Literature, Renaissance Literature, American Literature and English Literature after the 18th century. This curriculum can get a bit altered due to the particular preferences of the students, but it mostly surrounds itself with the above-mentioned subjects. Ph.D. in English Literature is an apex level degree in the subject, and therefore does not involve any formal degree after completing the course. The candidates who complete this course can voluntarily do further research on the subject or can pursue a job. Since Ph.D. candidates carry a vast amount of knowledge with themselves, they are offered lucrative and respectable jobs after completion of the course. Some popular profiles that are offered to such candidates are Professor (in colleges and universities), English Teacher (in coaching institutes and academies), Editors, Writers, Philosophical Journalist and Critical Journalist. As it is evident from the job profiles, major types of organizations that hire such candidates are Media Houses, Educational Bodies, and Literary Societies. Candidates having completed this course are offered starting CTCs of INR 5 to 8 Lacs.